Can your brain detect events before they even occur? That was the stunning conclusion of a 2012 meta-analysis of experiments from seven independent laboratories over the last 35 years, which found that the human body “can apparently detect randomly delivered stimuli occurring 1-10 seconds in the future” (Mossbridge, Tressoldi, & Utts, 2012). In the studies, physiological readings were taken as participants were subjected to unpredictable events designed to activate the sympathetic nervous system (for example, showing provocative imagery) as well as ‘neutral events’ that did not activate the nervous system. These readings showed that the nervous system aligned with the nature of the event (activated/not activated) – and what’s more, the magnitude of the pre-event response corresponded with the magnitude of the post-event response. The key observation in these studies is that human physiology appears to be able to distinguish between unpredictable dichotomous future stimuli, such as emotional vs. neutral images or sound vs. silence. 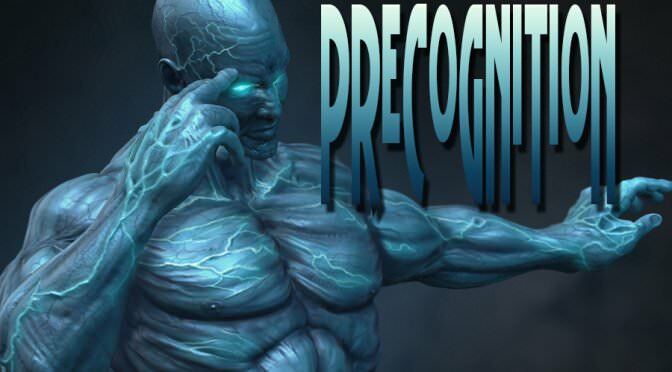 This phenomenon has been called presentiment (as in “feeling the future”). In this paper we call it predictive anticipatory activity or PAA. The phenomenon is “predictive” because it can distinguish between upcoming stimuli; it is “anticipatory” because the physiological changes occur before a future event; and it is an “activity” because it involves changes in the cardiopulmonary, skin, and/or nervous systems. A metaphor may help to provide an intuitive feel for this effect – watching a river move past a stick. The metaphor works as follows: Imagine that the direction of the water’s current is the conscious experience of the flow of time (temporal flow), and imagine that an intrusion in the flow (the stick) is an emotional, arousing, or otherwise important event. 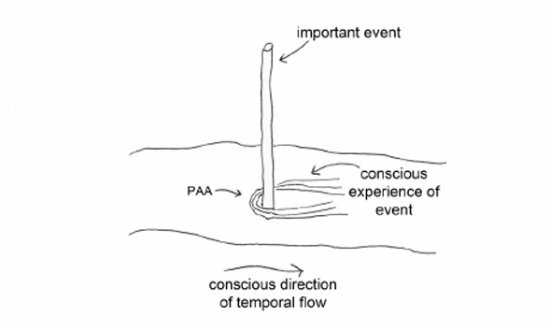 The largest disturbance in the water made by the intrusion is downstream (in the “forward” time direction), which is analogous to our conscious reaction to experiencing the important event. But if one examines the flow of water near the stick, one will also see a small perturbation upstream, anticipating the intrusion in the water downstream due to the back pressure. Similar to PAA, this upstream perturbation is a hint of things to come. It is not normally part of our conscious awareness and, as with disturbances in a flow of water, the majority of the effect of an intrusion is downstream of the intrusion. Nevertheless, as we always note here at the Grail, this is science at the edge so caveat lector. The authors of the recent paper too, urge caution until more extensive research is undertaken. “Until there is a gold standard experiment that is replicated across laboratories using exactly the same experimental procedure, physiological measures, and statistical analyses,”, they note, “there remains the possibility that multiple analyses could influence the body of evidence supporting PAA”. They recommend that all researchers investigating the topic register their experiments in advance “at any of several registries designed for experiments examining exceptional experiences”. I look forward to seeing the results of these future investigations. Or do I already know what the result is going to be?